Once, in a house on Egypt Street, there lived a china rabbit named Edward Tulane. The rabbit was very pleased with himself, and for good reason: he was owned by a girl named Abilene, who adored him completely. And then, one day, he was lost. . . .
Kate DiCamillo takes us on an extraordinary journey, from the depths of the ocean to the net of a fisherman, from the bedside of an ailing child to the bustling streets of Memphis. Along the way, we are shown a miracle – that even a heart of the most breakable kind can learn to love, to lose, and to love again. Featuring black-and-white illustrations and a refreshed cover by Bagram Ibatoulline. KATE DICAMILLO is the author of THE TALE of DESPEREAUX which received the Newbery Medal; BECAUSE of WINN-DIXIE, which received a Newbery Honor; THE TIGER RISING, which was named a National Book Award Finalist; and, most recently, the MERCY WATSON stories. She says, "One Christmas, I received an elegantly dressed toy rabbit as a gift. I brought him home, placed him on a chair in my living room, and promptly forgot about him. A few days later, I dreamed that the rabbit was face-down on the ocean floor - lost, and waiting to be found. In telling THE MIRACULOUS JOURNEY OF EDWARD TULANE, I was lost for a good long while, too. And then, finally, like Edward, I was found." BAGRAM IBATOULLINE is the illustrator of CROSSING by Philip Booth; THE NIGHTINGALE by Hans Christian Andersen, retold by Stephen Mitchell; THE ANIMAL HEDGE by Paul Fleischman; HANA in the TIME of the TULIPS by Deborah Noyes; and THE SERPENT CAME to GLOUCESTER by M. T. Anderson. He says, "It was a singular and most pleasurable experience to work on the illustrations for EDWARD TULANE and to be there with him on his journey. I must admit, I'm a bit wistful now that I've come to the end of this very special book." Just because it’s intended for a younger audience doesn’t mean there isn’t something worthwhile in there for us all. One reading is hardly enough to savor the rich philosophical nuances of DiCamillo’s story. I think I will go read it again right now. This achingly beautiful story shows a true master of writing at her very best. The story soars because of DiCamillo's lyrical use of language and her understanding of universal yearnings. This will be a pleasure to read aloud. Once again, DiCamillo harkens back to an older storytelling style, filled with magic and the transformational power of love. . . . The reader will be transformed, too. There will be inevitable comparison of Edward Tulane to THE VELVETEEN RABBIT, and Margery Williams's classic story can still charm after 83 years. But as delightful as it is, it can't match the exquisite language, inventive plot twists, and memorable characters of DiCamillo's tale. The delicate sepia images that head each chapter and the full-color illustrations augment the emotional tenor of the book. DiCamillo writes tenderly and lyrically but with restraint, keeping a tight focus on Edward’s experience and gradual awakening. Bagram Ibatoulline's exquisite illustrations cast a warm light across this . . . tale by one of today's most admired writers for children. DiCamillo has carved out a distinct place as one of her generation's most beloved writers. When Edward's journey ends, the reader will be wishing this story could go on and on. 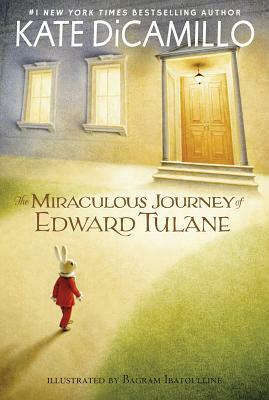 In the tradition of poignant, beloved children's classics like Don Freeman's CORDUROY and Anna Sewell's BLACK BEAUTY comes best-selling, Newbery Medal-winning author Kate DiCamillo's utterly charming creation THE MIRACULOUS JOURNEY OF EDWARD TULANE. . . . With traditional illustrations and text that begs to be read aloud, THE MIRACULOUS JOURNEY OF EDWARD TULANE will quickly take a place of honor on every child's bookshelf, undoubtedly and deservedly. DiCamillo . . . is a natural children's-book writer. This choice is destined to become a classic. DiCamillo’s book is as much a literary miracle as Edward’s transformation. DiCamillo’s newest offering is full of lovely, stately language, a riveting plot and a message that is heartwarming without being preachy. Fans of BECAUSE OF WINN-DIXIE and THE TALE OF DESPEREAUX will not be disappointed. . . .This tale has 'destined to be classic' written all over it, and it lives up to its great promise. A rare and beautiful book that remains in the soul. Elegantly designed, with delicate, full-color plate paintings by Bagram Ibatoulline, it has the look of a classic. Lovingly told, DiCamillo's affection for her characters shines through and overtakes you and by the book's end, readers will care deeply. A new classic has been forged. The powerful storytelling of bestselling author DiCamillo paired with Ibatoulline’s luminous paintings, will leave no reader - child or adult - unmoved. Beautifully designed, with plenty of old fashioned illustrations. A riveting tale, by turns sad and joyous. The miracle of Edward Tulane’s journey is the miracle of learning to love. Exemplifies the art of bookmaking as well as excellence in storytelling and illustration. A remarkable, eloquent and genuinely moving story. . . . Hang onto this title as one to remember for graduation gifts. Ibatoulline outdoes himself — Yet even standing alone, the story soars because of DiCamillo’s lyrical use of language and universal yearnings. The sad yet hopeful story of a selfish china rabbit that learns to love is beautifully written, and the sepia-toned gouache illustrations make this book one to treasure for many years.